My LEGO bricks have been hit with an evil growth ray. 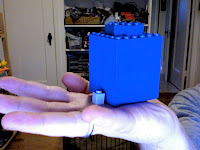 Well, either that or I was just messing around with The Unofficial LEGO Builder's Guide, and decided to build a large scale version of a 1x1 brick. The concept of oversized bricks reminds me of the Think Big store in New York City, where giant crayons and leather baseball mitt chairs were my definition of cool in the 1980's. If it was comically enormous, I was in. At six studs wide and tall, the littlest of bricks has been transformed. Although there is something pleasing about using LEGO bricks to make a larger version of the elements you used. It's plastic Voltron without the lions or Zarkon. Zarkon moved out last month, he'd overstayed his welcome on our couch.